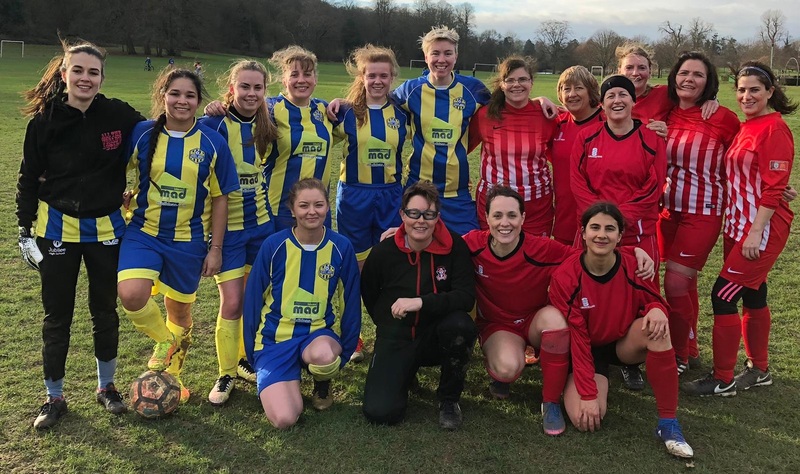 Reigate Women FC Lionesses have continued their lead in the Surrey FA Flexible League, after a win over Woking Diamonds, in Priory Park on Sunday 13 January 2019. The Lionesses have now won all three of their games in the tournament. In the match, Woking broke away after just eight minutes: despite an initial save by the Lionesses’ Beth Mulreanan, who was playing in goal for the first time, Woking scored to take the lead. But within two minutes, Libby Moy for the Lionesses got the ball outside the area and curled a strike into the far corner to equalise. The Lionesses were able to make it 2-1 after just 21 minutes when Anais Escalona capitalised on a lose ball in the box and struck firmly home into the bottom left hand corner. In the second half, Lionesses’ player/manager Becky Keogh’s corner was curled in to make it 3-1. Good play from Woking with seven minutes remaining led to them scoring the final goal of the game, meaning a final result of 3-2 to the Lionesses. The Lionesses are just one of three squads that RWFC have fielded in the league, although the only ones who were in action in the third weekend of games. The next set of fixtures is on Sunday 10 February.